Roses, lilies, irises and pinks form the quartet of flowering plants that have dominated European gardens for over six-hundred years. Pinks were first described in England in the 14th Century but were probably grown long before they appeared in print. While the status of most plants changes with shifting fashions, pinks, like the other members of the fabulous foursome, have remained continually popular with gardeners. Pinks are part of the genus Dianthus, that also includes carnations and the biennial, Sweet William. The dividing line between a carnation and a pink is very blurred. Carnations, descended from Dianthus carophyllus, tend to have large, unscented flowers that are top-heavy on their long stems. The complicated staking they require make them difficult plants to use in the garden. Most carnations are grown for the cut-flower trade and end their lives wreathed in plastic on garage forecourts. A fitting end, some would say, for a charmless plant. Pinks are descended from D. plumarius and are much more compact plants that are not troublesome to grow. Most of all, though, their elegant flowers have a heady scent of cloves and other spices. One whiff and you understand immediately why their popularity has endured. 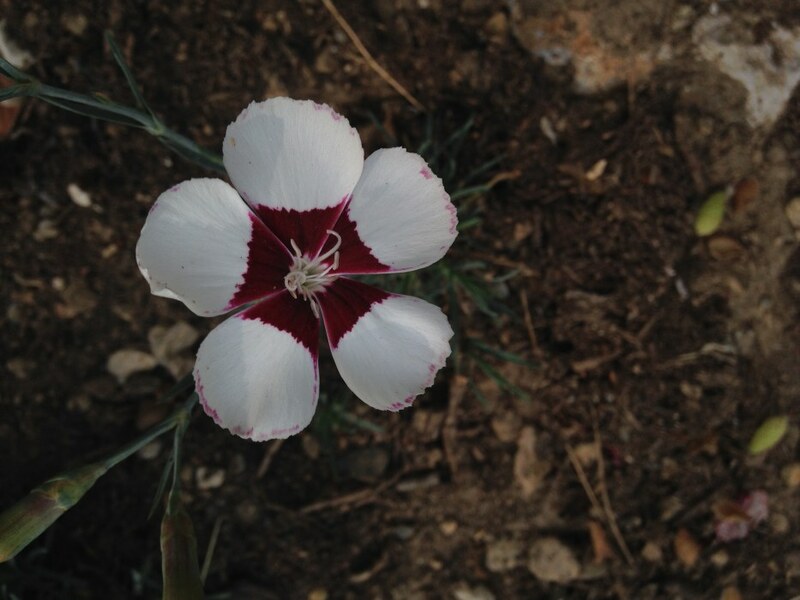 Nearly four hundred species of Dianthus are found in the wild across Asia, Europe, the Mediterranean and Africa. If very few of the species are found in gardens, it is probably because the hybrids and cultivars that are descended from them make much more interesting garden plants. Of the three native British Dianthus the rarest, the annual ‘Deptford Pink’ Dianthus armeria, is best left for botanists to coo over. Once widespread around the Cheddar Gorge, the strongly-perfumed flowers of Dianthus gratianopolitanus were so popular with nineteenth-century gardeners that it was collected to near extinction. It’s still worth growing for its scent alone. The most commonly-grown of the native species, Dianthus deltoides, now only found in part of East Anglia, has creeping-dark green stems and small crimson-red flowers. Of the many cultivars available, I grow Dianthus deltoides ‘Alba’ for the contrast between the dark evergreen foliage and the bright white flowers. 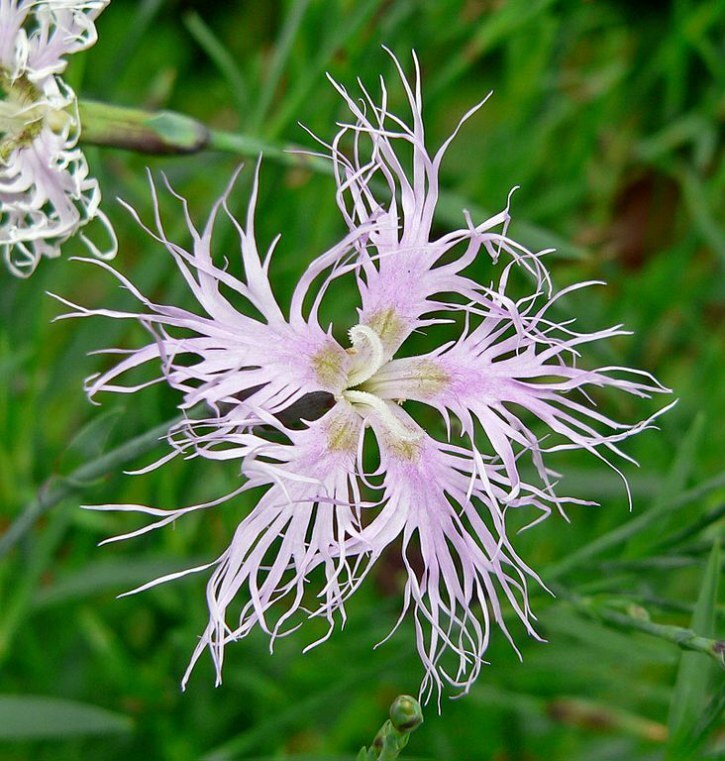 Dianthus plumarius, the mother of all pinks, has sweetly-scented fringed-petaled flowers that range from pink to white-with-a-hint-of-pink. Although it is only 20cm tall a single plant can spread up to 60cm. Its variability of colour in the wild led to the introduction of a seed-raised strain in the first half of the twentieth century by Joseph Sangster, the Ipswich-based owner of seed merchants Thompson & Morgan. The range was so popular with gardeners that they became known as ‘Ipswich Pinks’. Dianthus superbus has a stonger, spicier perfume than Dianthus plumarius with white spidery, will-o’-the-wisp flowers that John Parkinson, (the 17th-century gardener, writer and friend of both Gerard and Tradescant) described as ‘comforting the spirits and the senses’. Several years earlier Gerard himself had been showing off a newly-acquired pink with yellow flowers. 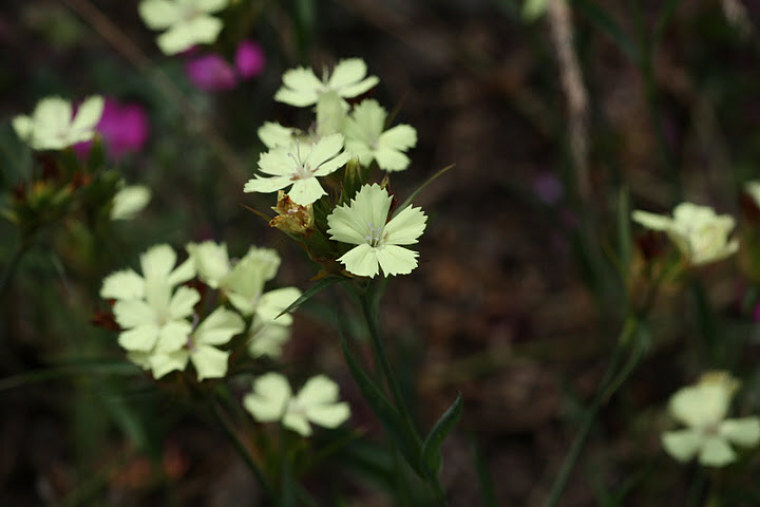 Gerard’s plant was almost certainly Dianthus knappii, the only yellow-flowered dianthus. With the vogue for prairie-style plantings Dianthus carthusianorum is seeing an increase in its popularity. Long thin stems make it the perfect partner for low growing grasses such as Stipa tenuissima and Stipa arundinacea. Its dark magenta flowers and even darker buds float daintily amongst the grasses. With so many old cultivars to choose from its difficult for the gardener to make a choice. 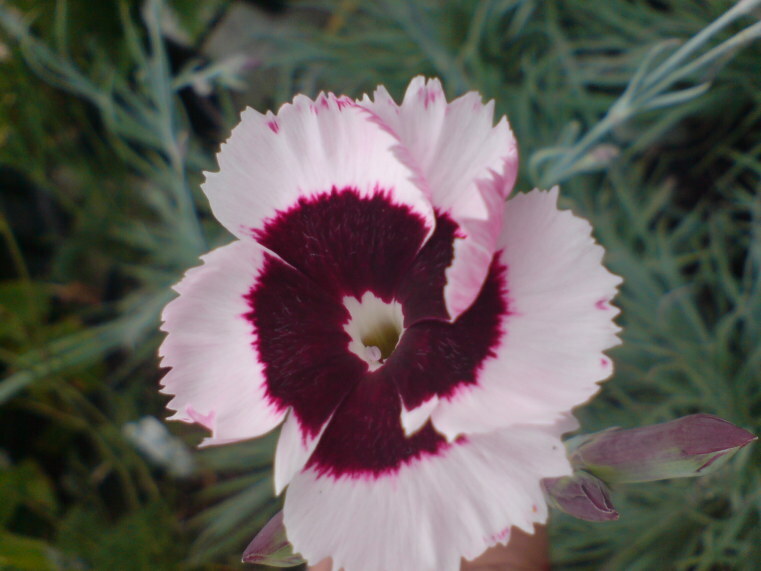 Top of anyone’s list should be Dianthus ‘Pheasant’s Eye’, which dates back to 1690. The centre of the flower is deep red and the fringed white petals have a red stain to their tips. The perfume is softer than other pinks. Dianthus ‘Rose de Mai’ as the best all-rouder: a vigorous and floriferous plant; silver foliage that complements the pale mauve flowers and the strongest scent of any pink. For vigour and fragrance she also advises Dianthus ‘Bridal Veil’, a tight mass of frilly white petals with a red centre, and the pure white Dianthus ‘Mrs Sinkins’. During the mid-nineteenth century the weavers of Paisley in Scotland were enthusiastic pink breeders and collectors. Dianthus ‘Dad’s Favourite’ is thought to be one of the few surviving Paisley Pinks. Each of its white petals is edged with a broad ruby-red line. Pinks are at their peak during June and July. At the beginning of the 1900’s plant breeders tried to develop repeat-flowering ones. Montagu Allwood eventually produced a range of long-flowering pinks that become known as Dianthus x allwoodii. Unfortunately his plants had little perfume. Scent had been sacrificed for flower production, although Allwood’s best-known plant, Dianthus ‘Doris’ does have a slight scent. Recently plant breeders have realised that gardeners want pinks with a scent. Breeder John Whetman has produced a range, known as the ‘Devon’ series that are both long-flowering and perfumed. The word pink has been used to describe Dianthus since the 15th century . It wasn’t until two hundred years later that ‘pink’ was used to describe the colour. It is an indication of how widespread the plant was that its name should become accepted as a description of anything that shared its colouring. The exact origin of the word itself is unclear, but may have descended from the Dutch and refer to the pinking around the edges of the flower’s petals. A less attractive possibility is that the word descends, also from Dutch, from the description of an eye disease that left the eyes bloody – a reference to the red centre of many pinks. The earliest depictions of pinks can be found on the designs of twelfth-century Turkish tiles. During the fifteenth and sixteenth century representations of pinks and carnations often featured in religious paintings and Books of Hours. In the Flemish artist Hugo van der Goes’ painting ‘The Adoration of the Shepherds’ (c. 1480) a group of pinks is growing in the corner of the stable. Perhaps the most famous depiction, though, is in Rapheal’s ‘sMadonna of the Pink’, painted in about 1506 and now hanging in Britain’s National Gallery. 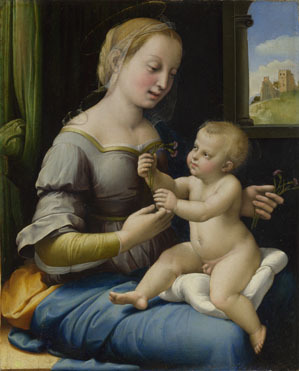 In it Mary tenderly looks on as her child playfully amuses himself with a pink. In medieval art a flower was never just a flower, but a symbol of something else. The pink become to symbolise many ideas, chief amongst them enduring devotion and love as displayed in Raphael’s painting. Later pinks came to represent marriage and wealth, but it is the plants association with lasting affection and love that led the flower to be chosen as a symbol for Mother’s Day when it was established in America in 1910. An elderly gardening friend, speaking disparagingly of the gardening skills of her neighbour told me that ‘she couldn’t even grow pinks’. An unkind remark, but an accurate reflection of how easy pinks are to grow. Their essential requirements are for a well-drained soil and an open, sunny. Even partial shade from overhanging shrubs or other perennials will lessen their flowering. They dislike acid conditions, and heavy clay soils should be improved by adding horticultural grit. While alpine pinks need no extra nourishment, border pinks are heavy feeders and will stop flowering after a few years if they are not given an occasional top-dressing of a general fertilizer. Don’t be tempted to use an organic mulch to feed pinks, as it’s moisture content can cause the plant to rot. By the end of summer plants can become straggly and messy and should be cut back. Very old, woody plants look ugly and should be dug up and new ones planted. It’s as easy to make new pinks as it is to grow them. Cuttings, taken between June and September will root quickly and make strong plants the following year. To take a cutting, known as pipings, firmly hold the stem in one hand just below a leaf node and pull the rest of the stem sharply with the other hand. Remove the lower leaves and you have a cutting. National Collection holder Mark Trenear recommends soaking the cutting in water overnight before potting them up into a seed tray or pot.